Dr. Thomas L’Ecuyer (left) and Dr. James Gangemi. Photo by Jackson Smith. It’s 4:45 a.m., and James Gangemi, MD, is starting his day: exercise, breakfast, and then he’s off to work. The routine sounds typical, but the situations he encounters on the job couldn’t be more unique. That’s because his office is an operating room, and his clients are children who need congenital heart surgery, some of whom are on the brink of heart failure. As director of pediatric cardiothoracic surgery, James Gangemi is part of a team that performed 13 pediatric heart transplants in 2018. While that is an astounding number for a hospital of UVA’s size, the program’s success and accolades, Gangemi says, are the result of teamwork. “Transplant medicine is the epitome of a high-functioning team, and our team is always prepared, we have a tremendous work ethic, and there are no egos here—everyone is important,” Gangemi says. One of those important people who works hand-in-hand with Gangemi is Thomas L’Ecuyer, MD, a pediatric cardiologist and medical director of pediatric heart failure and transplant. Before a surgery is deemed necessary and the flurry of coordination begins, a network of doctors and nurses are working behind the scenes to investigate and diagnose the most life-threatening cases. This is where L’Ecuyer lends his expertise. 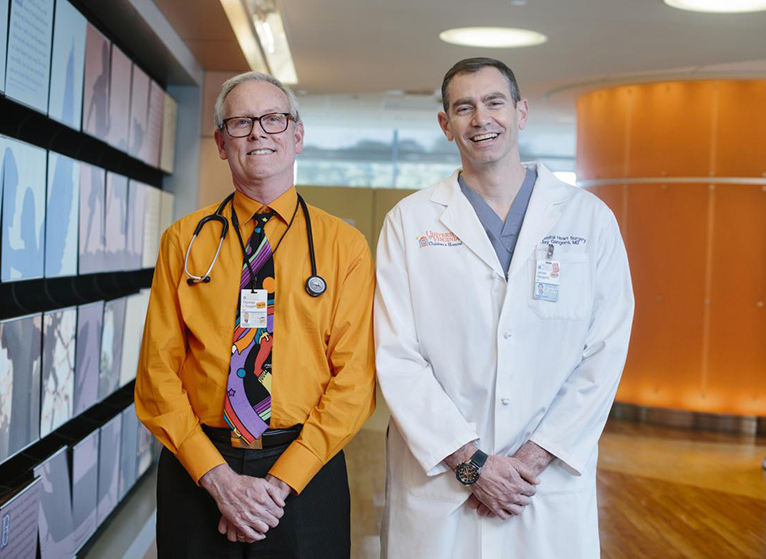 Because UVA is the only hospital in Virginia that performs pediatric heart transplants, L’Ecuyer is in constant communication with pediatric cardiologists throughout the Commonwealth. When a child is ultimately referred to L’Ecuyer, he follows a two-step mental process. First, he wants to exhaust any other existing therapies that could possibly help the child recover. However, if it’s determined that the child does, in fact, need a heart transplant, then L’Ecuyer moves to step two: rapidly determine if the child has any conditions that make transplant a poor option, register the child for transplant as quickly as possible, and then take precautions that will maximize the child’s chances of survival until transplant. Among others, these precautions include treating the patient for their existing heart failure, optimizing their nutrition, and admitting the patient to the hospital when heart failure worsens to increase support and elevate their status on the waitlist. U.S. News & World Report ranks UVA among the top 50 hospitals in the country for pediatric cardiology and heart surgery, and last year the team performed nearly 300 total heart-related procedures, 46 of which were on babies 30 days old or younger. In such a high-stakes field that demands an incredible amount of specialized skill, it would be natural to think Gangemi and L’Ecuyer are primarily nervous about executing the technical aspect of their jobs. But it’s more complicated than that. Confident in their training, ability, and peers, it’s actually the emotional gravity of the situations that weighs the heaviest. Similarly, Gangemi places a great deal of importance on communicating with, and having a sense of empathy for, the family. “I always say that when I became a dad, I became a better doctor,” Gangemi adds. At the core of this team is an immense feeling of ownership and responsibility, an understanding that, in a sense, the young people they’re caring for are their own. And the elation they experience when the child pulls through—Gangemi and L’Ecuyer say that language simply doesn’t do it justice. L’Ecuyer recalls a recent child who required life support from an ECMO machine (which pumps and oxygenates a patient’s blood outside the body, allowing the heart and lungs to rest) for three months after transplant. As for the future of pediatric heart transplant at UVA, Gangemi sees nothing but potential.